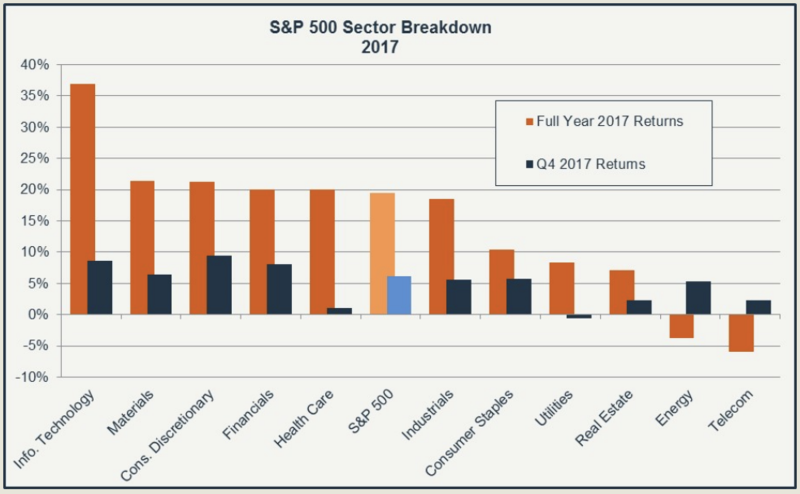 The strong 2017 stock market was fairly broad-based with only two of the eleven S&P sectors (Energy and Telecom) declining for the year while six gained 18% or more (see chart on following page). Information Technology stocks gained nearly 37% as the growth/momentum rally continued unabated for much of the year, with individual companies like Mastercard (up 47%), Apple (up 46%), and Microsoft (up 38%) enjoying particularly strong performance. Looking ahead, the way S&P breaks out sectors will look quite different in the not too distant future. Maybe as a result ofTechnology’s dominance (by 12/31/2017 this sector comprised nearly 24% of the S&P 500 index’s market capitalization), theGlobal Industry Classification Standard committee announced that several major Technology companies (including Facebook and Google) will be recategorized into a new sector entitled Communication Services. This sector will also include the entirety of the soon-to-be-former Telecommunication Services Sector (which represented just 2% of the index at year-end) as well as other media/internet companies like Netflix, Comcast and TripAdvisor. S&P will release the full list of securities to be reclassified on July 2nd, so until then we won’t know exactly what the sectors will look like, but investors should expect a smaller(at least for now) Technology sector and a larger Communications sector. That said, it is important to take these classifications with a grain of salt. As investors, we do not make decisions based on a company’s sector. We may, at times, find thematic ideas via an industry or sector that is out of favor for some reason (more on that later). Additionally, the determination of which sector to place a company in often seems somewhat arbitrary. For example, “tech giant” Amazon is officially a Consumer Discretionary company and CVS Health (that is their official name) is aConsumer Staple, not a “Health Care” company. Now, if CVS’s proposed merger with health insurer Aetna is approved, an official reclassification would seem likely, but until then the largest US pharmacy benefits manager and drugstore chain is not(officially) a Health Care company. Just over a year ago S&P made another major change to its sector classifications when it carved Real Estate companies(mainly Real Estate Investment Trusts, or REITs) out of the Financial Sector as a standalone group. Real Estate is comprised of a diverse set of industries - from office space and shopping malls to high tech labs and computer server farms that are the backbone of cloud-based computing. When REITs were spun out into their own sector in late 2016, they were capping a strong multi-year run and good value opportunities were lacking in the space. More recently, REITs have fallen out of favor somewhat as rising interest rates have dampened investor enthusiasm for these sometimes debt-dependent and high yielding entities. REIT’s financial statements do not look exactly like typical corporations due to a complex ownership structure, so common screening techniques do not apply in quite the same way.They are also required to operate within a distinct set of rules (for example, they must payout at least 90% of their income) and measures such as funds from operations and net asset values of properties must be examined to determine the relative attractiveness of an investment opportunity. 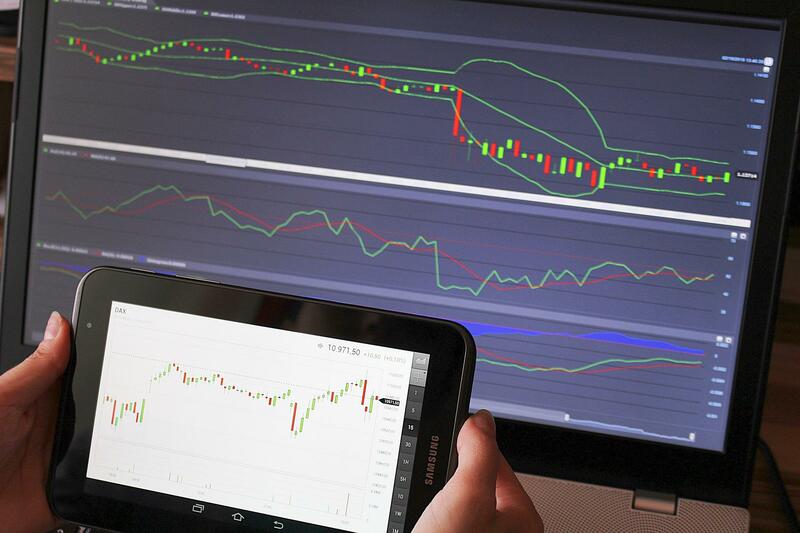 We continue to actively monitor this space for great businesses trading at attractive valuations. In this article we focused on the diversified large cap S&P 500 index even though the far less diversified Dow Jones Industrial Average had an even stronger year in 2017, rallying25%. One big difference between the two indices is that the S&P is market cap-weighted, meaning the bigger the company the greater the impact on index returns. The Dow, comprised of just 30 distinct companies, is price-weighted, so (in somewhat oversimplified terms) the higher the dollar price of the stock the greater the impact on index returns, regardless of the actual size of the company. As a result, Boeing, a stock that defied gravity in 2017 by nearly doubling, ended the year with a dollar price of $294.91 and had an overwhelming impact in propelling the Dow to its strongest annual gain since 2013. Conversely, General Electric, with its well-publicized abysmal year, closed the year at under $18/share, meaning its negative returns barely impacted the Dow’s performance. When looking at benchmarks, it is important to understand these differences.